Special Deliveries…Love them, Good eats…Love them. Especially if they are a special delivery with good eats in them! Also love having a good time. Here are a few of all the above. I recently subscribed to a Vegan Monthly Delivery Box called Conscious Box. Here’s their Mission. I was so excited when the box arrived I could not wait to share it with you. Look at all these goodies…While I am not Vegan, or even vegetarian, I am currently working on how I live my life and choices I make. I realize that you have to start somewhere. This box was loaded with great items. Teas, coffee, chocolate, snacks, and hb&a items. It was nicely packaged and the quality and quantity was amazing. Sharing time… I made a really great crab sandwich the other day. Delicious. Seriously, it was delicious. I added a side of roasted broccoli, but this sandwich could have stood alone on the plate. One of my favorite lunches lately has been a ham and egg salad. I have been finding fresh spinach and sprouts at the farmers market along with some cucumbers and avocados and just mixing it all together and enjoying. Recently I won a giveaway on Erin Berries Blog for Rebootizer. I have started it and cannot wait to do a quick review on it once I have completed the detox plan. My amazing friends at Chobani sent me a 6 pack of their 16 ounce blended flavors. Okay here’s where the gushing comes in. I love this company, they are amazing friends to us bloggers, and on top of that their products are GREAT. I absolutely am in love with the Vanilla Chocolate Chunk. I did share approximately 2 teaspoons with my husband, I felt like in order to do an honest review I had to eat the rest! Then I started in on the Mango. I really love the blended flavors. I have always been a huge fan of Chobani’s fruit on the bottom Pineapple flavor, but now feel like I should alternate my Chobani love to the blended yogurt as well. I am planning a few post with some of the ways I enjoyed the Chobani yogurt other than straight out of the container. What can I say, I sometimes can’t help myself. Once it hits your lips, it’s so good! (Old School Movie Reference). Sorry. I have been on a roll with blog giveaways lately and hit it BIG with the next two prizes. First up I won a $50.00 gift card to Lululemon. One of my favorite bloggers Calee from Life + Running was hosting this giveaway, and I could not have been happier when she notified my that I had won. I am so looking forward to spending that gift card. When Lululemon sent me the gift card they also sent me a reusable bag that I think I will use as my lunch bag and a change purse. Loving them lots right now. My next big prize was from Rachael at Passing Daisies. I have been reading Rachael’s blog for a long time and love her dedication to honest blogging. She really has well written posts with some great recipes. So back to the prize, I won these Zaggora HotPants. I was really pumped about these HotPants and put them to the test and loved them. Here’s some information on them taken directly from their webpage. HotPants increase energy expenditure during exercise by 6% versus the control garment. HotPants increase energy expenditure in the hour after exercise by 26%*. In 30 minutes of exercise, weight loss is around 4x greater in HotPants than in a standard garment. On average, subjects lost 1.13% of body mass in HotPants compared to 0.27% in the control garment. HotPants increase the core body temperature by an average of 18% more than the control garment, which leads to an increase in metabolism. I ordered the Orange, because it’s so HOT right now. Nah, I just love Orange. How cute are they? I can tell you this from just wearing them once, I sure did sweat more doing the same workout I normally do. So I will have to keep you posted on them. They have a Take the Challenge for new users of the HotPants. So me loving a challenge is all in. What they expect is just this: Wear the pants a few times a week during exercise and share your results! Easy. Like I said I am all in. So I will share my experience here with you once I have completed said challenge. Orange HotPants are so hot right now! Just saying. Now on to a few of the good times I was talking about earlier. Hit a Tigers game with my husband over the Labor Day week-end. Even though we lost and it was 86 degrees, we still had a great time. I love going Downtown Detroit, the city is always so much fun. We had a few beers, had some hot dogs and some frozen lemon aid. It was a fun afternoon ball game. We also spent time with our friends having a few beers at a backyard birthday party. I do love beer. Another reason I am happy I won the Rebootizer, I could use a detox plan after indulging on so many festive foods and drinks this summer. It really has been the summer of fun. I threw in this picture. I love this picture. It was taken on a houseboat trip I took in August. There was 30 people on this trip and all us girls got together and all piled on a floating island with our drinks and took tons of pictures, this picture happens to be my favorite. So much fun. Girl Power. I included this picture because it’s pretty and I love water lilies. Killian and Stuart say Hi! See my Orange stripped sweater with the Orange tissue tee, told ya I am loving Orange right now. How cute are my fur babies? They look freaked out in this picture, but man I just love their little faces. They make my heart go Pitter Patter. Loving a good old egg breakfast. One for me two for him. Microwave for one minute and thirty seconds. Make sure to spray the glass container with cooking spray. Toast an English Muffin, top with cheese and get your egg on. Done. I could pound down two of these without a problem, they are so good. Easy fast food, made at home. Question of the Day: Have you ever blown up an egg in the microwave? I have. Messy. Very Messy. Snack Plate Rules! I love them, and my typical snack plate looks like this. I have been addicted to hummus as long as I can remember. Recently I tried a new brand, I always thought I would never stray from my favorite brand Sabra, but the Kroger brand is just so amazing. I bought it for the first time on my last shopping trip, because the plain Sabra flavor was sold out. The texture and thickness of the Kroger’s brand is perfect. So on my snack plate is the Kroger’s hummus, a string cheese stick, a whole wheat pita, carrot sticks and a hard-boiled egg. The combination of this snack plate kept me as full as a meal would. Loved it. In other news, I never heard back from the Luna Bar Winner so I did a Redraw and the New Winner is: Meagan, who I have already notified. Meagan your package is on the way! Well this is the last and final week of Boot Camp, and I can truly say I will be walking away from it with New Friends, New Confidence and New Moves. I have said it before during these last 7 weeks and I will say it again, I love Boot Camp, I learned so much. I cannot think of a time where I pushed myself more to achieve a fitness goal. Here’s My Fitness Confession: I am no longer a Cardio Junkie, I Love Lifting Weights. 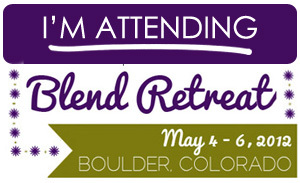 Blend Retreat News: I have roommates. I am paired up with a non-blogger named Patricia, who I can not wait to meet. I also have two other roommates: Amanda at Diary of a Semi-Health Nut, and Katie at Talk Less, Say More. I am really excited to meet them all and have a great weekend. Question for the Day: What is your current fitness goal? Here’s Mine: To continue learning new exercises involving weight training.